The Tower of London has many important building to explore. Begun in the reign of William the Conqueror (1066-1087), the White Tower marks the start of the Tower of London's History. There is an exhibition inside of knights & armour. The Tower of London was a residence for the kings and queens of England as well as being a fortress. These rooms are shown as they may have appeared in the reign of Edward I (1272-1307). Presentations by costumed guides and an exhibition about how the buildings were restored can be found inside. The Tower of London has been home to the world famous British Crown Jewels since the beginning of the 14th Century. Still used by the Queen and her family today, the Crown Jewels are an essential part of the visit. Photography is not allowed. Inside you can see two films: The coronation of the queen , and a film about crowns and other objects used in the coronation. After that you can see some of the actual objects while you stand on a moving platform. The Tower of London is surrounded by a series of massive defensive walls. A walk around this eastern section provides an opportunity to see how the wall towers have been used since the 13th century. This tower houses an exhibition, "Crowns and Diamonds: the making of the Crown Jewels" (in collaboration with De Beers). Some of the Tower's most famous prisoners were held around Tower Green including Sir Walter Ralegh, kept in the Bloody Tower for 13 years. At the scaffold site two of Henry VII's wives, Anne Boleyn and Catherine Howard, were beheaded. The Chapel Royal of St Peter ad Vincula is open for public worship on Sunday mornings (except in August). Otherwise the Chapel is open to the public only as a part of the main Yeoman Warder guided tour, or from approximately one and a half hours before closing time. In the Bloody Tower you can see a presentation of how Sir Ralegh's study and bedroom looked like. Yeoman Warders (often called Beefeaters) have been at the Tower of London since the 14th Century. Today they combine their traditional ceremonial role with that of tourist guide. There is a main tour by a Yeoman Warder in English (only). The warders will be happy to answer any questions you may have. They will also be glad to let you take their picture or have your picture taken with them. ,enclosing a stamped addressed envelope or coupon-respone international. Some text in this page is from the Tower's leaflet guide. 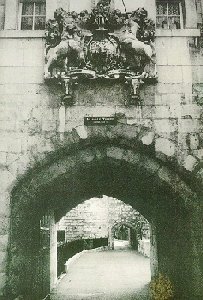 The pictures of The Crown Jewels, The Medieval Palace , The Yeoman Warder, The entrance are from the Tower's leaflet guide.